Jason`s lean rinsing bodybuilding conditioner delivers weightless manageability and volume to fine, thinning hair. Hair-strengthening panthenol and biotin help stimulate hair growth to restore thinning, weak hair while fortifying vitamins A, C and E nourish the entire hair shaft for improved volume with fewer fly-aways and split ends. Your hair looks fuller and shinier, and feels thicker and softer. After shampooing, massage conditioner through clean damp hair. Leave on for 1-2 minutes.Rinse thoroughly. 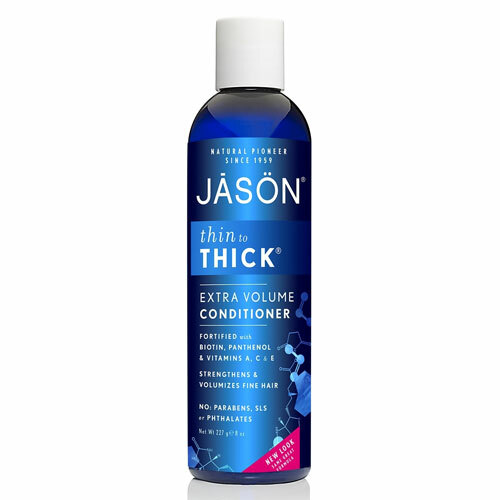 For best results, shampoo with Jason Think to Thick Extra Volume Shampoo. 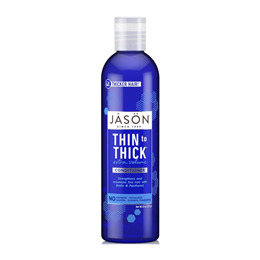 Below are reviews of Jason Thin to Thick Extra Volume Conditioner - 240ml by bodykind customers. If you have tried this product we'd love to hear what you think so please leave a review.